Considering the major role of confined cell migration in biological processes and diseases, such as embryogenesis or metastatic cancer, it has become increasingly important to design relevant experimental set-ups for in vitro studies. Microfluidic devices have recently presented great opportunities in their respect since they offer the possibility to study all the steps from a suspended to a spread, and eventually crawling cell or a cell with highly deformed nucleus. Here, we focus on the nucleus self-deformation over a micropillared substrate. Actin networks have been observed at two locations in this set-up: above the nucleus, forming the perinuclear actin cap (PAC), and below the nucleus, surrounding the pillars. We can then wonder which of these contractile networks is responsible for nuclear deformation. The cytoplasm and the nucleus are represented through the superposition of a viscous and a hyperelastic material and follow a series of processes. First, the suspended cell settles on the pillars due to gravity. Second, an adhesive spreading force comes into play, and then, active deformations contract one or both actin domains and consequently the nucleus. Our model is first tested on a flat substrate to validate its global behaviour before being confronted to a micropillared substrate. Overall, the nucleus appears to be mostly pulled towards the pillars, while the mechanical action of the PAC is weak. Eventually, we test the influence of gravity and prove that the gravitational force does not play a role in the final deformation of the nucleus. The online version of this article ( https://doi.org/10.1007/s10237-019-01144-2) contains supplementary material, which is available to authorized users. This work was funded by a PhD fellowship of the French Government. 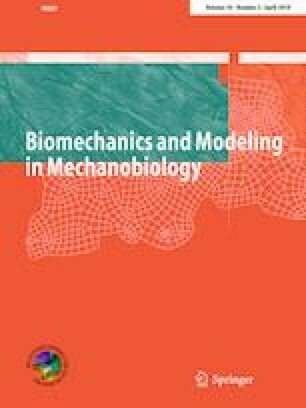 We thank the editor of the Biomechanics and Modeling in Mechanobiology and the reviewers for their very interesting comments and suggestions.